Hair Headlines: Bangs and Plastic Surgery -- 3rd UPDATE! It all started with the following article by Greg Lindsay, which appeared in Women's Wear Daily during February 2004, and was re-posted at a television news web site. We have edited some lines not specifically dealing with hair. Hemlines, rather than hairlines, are usually the fashion world's focus, but Katie Couric's [above] current 'do may be worthy of special scrutiny. The new bangs she's been sporting on the "Today" show lately aren't just part of a trend - sources said they're about to double as camouflage. America's Pixie is on the verge of going under the knife for a major brow-lift courtesy of Dr. Craig Foster, the plastic surgeon best known for reconstructing the face of the Central Park jogger, according to sources familiar with the situation. While such a procedure might seem a bit drastic in the age of drive-through Botoxing, Couric and her TV personality peers have a new reason to be afraid about losing their looks - high-definition television. Last fall, New York magazine named Foster one of "beauty's best" doctors in the city, and noted that he had started using the Endotine brow-lift treatment that sources said Couric will likely undergo. Endotine patients have small incisions made in the forehead where tiny hooks are inserted that pull the skin of the brow taut. Six to eight weeks after insertion, the skin resettles at the higher elevation, while the hooks - which are biodegradable - gradually melt away six months later. 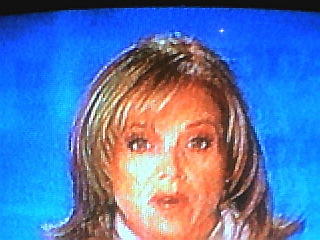 Initially, the change in appearance can be jarring, and during those six weeks the patient's skin gradually crawls up her face - something "Today" show obsessives might chart if Couric's new bangs (a common camouflage technique) weren't in place. "In her business, and I know her very well," said Lesesne, "there's a life span, and there are hundreds of people behind her who want her job. And this is her image she's protecting." Just in the last few days, the New York Post had an item about a supposed run-in with a Manhattan doorman and Women's Wear Daily alleged she was preparing for cosmetic surgery. "What happens is it gets repeated and gets repeated and now I think everybody in the country thinks I'm having plastic surgery! ... If I ever do decide to get plastic surgery, I'll do it on the show. I mean, I did a colonoscopy. How much worse can it be?" NBC "Today" star Katie Couric is no longer wearing bangs, perhaps to quell reports that she was about to go under the knife to raise her eyebrows. A change in hairstyle is often a tipoff that a celeb is about to undergo facial reconstruction - in this case, an endoscopic brow-lift in which tiny, biodegradable "hooks" are inserted under the skin, causing the forehead to creep upward ever so slowly over weeks. Women's Wear Daily is standing by its story that Couric had scheduled the procedure with plastic surgeon Craig Foster, who put the Central Park jogger back together again. "Complete nonsense," Couric's spokeswoman insisted to New York Magazine. "We didn't even know what a brow-lift was." Now, Couric's hair is out of her eyes - and the hooks are at the center of a lawsuit. Celebrity surgeon Z. Paul Lorenc, who says he invented the hooks, is suing the company that's selling them to other docs. One can only hope, the magazine notes, that a legal settlement does not require repossession of hooks already implanted. And these pictures from 11 June leave no doubt. The bangs have become a sideswept look, extending a bit below eye-level. 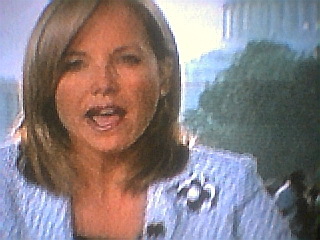 If Couric had plastic surgery, we can't notice it.